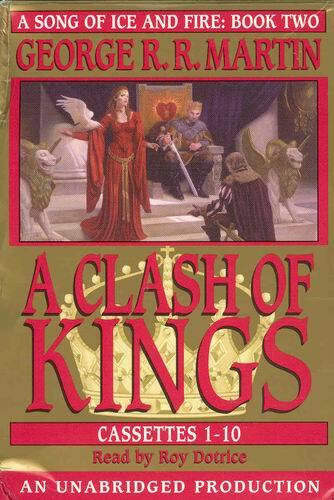 A Clash of Kings continues the saga started by George R.R. Martin in A Game of Thrones. There are six projected volumes in this series. The first three novels are currently in print, and all three of them are now available on unabridged audio from Random House Audio or Books on Tape. A Game of Thrones and A Clash of Kings are also available on Audible.com. This volume is frankly more of the same kind of thing experienced in A Game of Thrones. 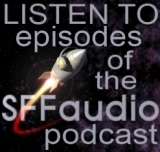 (See the SFFAudio review of A Game of Thrones here). In this case, that’s a good thing. A Clash of Kings is a direct continuation of the first volume with the addition of several new characters. The stories of members House Stark and House Lannister were again the center of the plot – their struggle for power in the land of Westeros continues, while the supernatural threat from the North continues to gather, and Daenerys Targaryen, with her dragons, gains power. Tension runs high throughout the book, and resolution is left for future volumes. George R.R. Martin has created a medieval world filled with interesting characters that I continue to care about. The plot is complex, and each time I felt a question was answered, a new mystery unfolded. The myriad of characters created a challenge for narrator Roy Dotrice, but again he does a fabulous job. With captivating skill and range he charges on, unfolding the story chapter by chapter, character by character, event by event. The book is certainly a marathon for the listener, but by the end, after 37 hours, I was (and am) still eager to continue listening to this truly excellent fantasy series.